My car is currently stock, the guy before me replaced the exhaust but I haven’t checked what it is yet. My intake has a ton of leaks. If I order this what else do I need besides an access port to so my car runs properly? A: The accessport should be just fine. Shouldn't need anything else. I’m in need of a replacement bracket for this, where can I find that? A: You will need to contact Cobb Tuning customer support to get a replacement bracket ordered. What horsepower increase could I expect from my 2010 WRX with a CAI and box? A: You should see about a 5-10 HP gain with tune. A: The intake can be installed without the box but it will be pulling in hot engine temperature air. Because of this and the possibility of power loss due to the intake temps, the air box is also highly recommended. Hey so I have the sf intake with the airbox and I am ready to go fmic and was hoping if I can keep the box while using a Cobb fmic?? Any fitment issues? A: That would depend on what front mount you decide to go with. Some will work with the stock intake some won't. 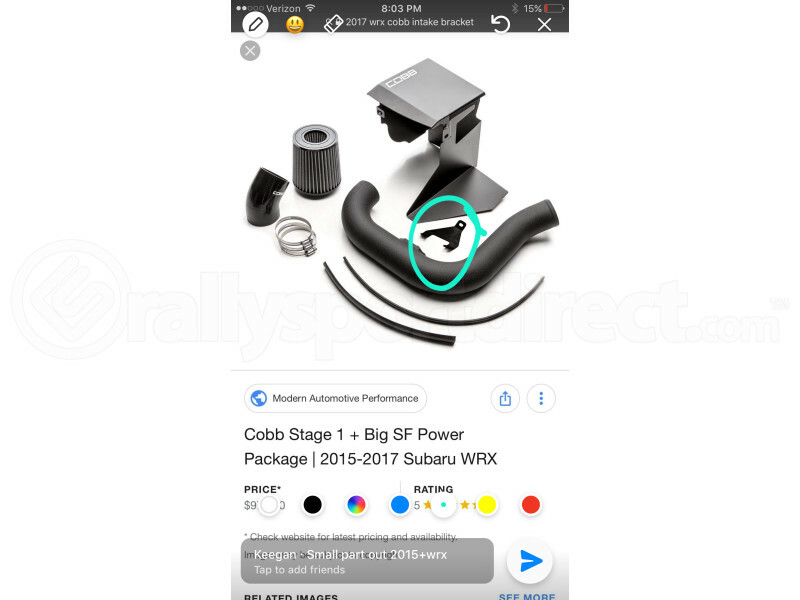 So in the fitment guide you have it does not list the Forester XT, but on the Cobb website it says it is the same one for the FXT and WRX. Is this a different product than the one I am seeing in their site? Does this filter come oiled or do you have to purchase it separately? A: Yes, the intake filter will come pre oiled. Although, You can purchase the cleaning kit separately for cleaning it in the future. I am looking to purchase the COBB SF Intake but i have a few questions before I do. 1 - Can i install this with out having an AccessPORT? 2 - If so, would I have to have my car tuned after install? A: This can be installed without an Accessport but a pro-tune is required. I have heard many bad things about using oiled filters. Can you ask for a dry filter or is the oiled filter the only option? A: This will only be available with Cobb's SF filter, which is an oil based filter. As long as the filter does not get over-oiled, there should be no issues as long as the car is tuned for the intake. What are the benefits of having this intake over the stock intake ? A: This intake is going to be less restrictive than the OEM intake bringing in more air and the metal air box is going to lower your intake temps which is better for performance and longevity of your motor. I should add that a tune would be required for this piece. if I have an invidia q300 and the cobb intake will I need an access port or protune? Is this C.A.R.B. legal for the 2013 WRX? If not, are any there any CAI that are? I was looking at the AEM 21-478WR but as of now I know it is not legal. will this fit on my 09 wrx? A: This intake/ air box is confirmed to fit on the 2009 WRX :) Thank you! if I would get this intake and invidia Q300 exhaust with an access port, would I tune it to what i want or would I need to get a pro tune. A: You can use the Stage 1+ SF Intake map for your setup. A: Due to the placement of the airbox this system would not work with a FMIC due to piping clearance issues. You could alter/modify parts to fit, but as is it would not fit. Is the increase in noise using the Cobb sf intake and air box due to the figment issues at the air box? Could that be resolved by sealing the connection via duct tape, etc? A: That is due to the higher flow of the intake system. As the flow of a system increases, so does audible noise output. A: We have not done a direct comparison of the Cobb and Cosworth intakes, but you can expect roughly the same power. The Cosworth intake will be slightly louder because the heatshield does not offer quite as much coverage as the Cobb airbox. Hello i would like to use T-clamps instead of the regular supplied clamps. What size t-clamp would i need? A: The post maf hose has a 3 inch inner diameter and the 3.5 inch clamps should fit the hose. How come this short ram intake requires a tune but for instance the cosworth cold air intake does not require a tune?. A: It is the manufacturers that say the intakes will or will not require a tune, however we have found that any aftermarket intake on the 08+ models will require a tune. Thanks. does this fit the 2011 subaru wrx sti sedan? A: This is confirmed to fit the 2011 STI without issues. Will this fit with a cosworth intake mani and a turbo xs FMIC? A: We are not able to confirm fitment between those three products but I would suspect that the airbox and the FMIC piping would have some major fitment issues if installed together. Thank you. A: There are a few different variations of both Stage 1 and Stage 2 but basically Stage 1 is going to be a stock vehicle and Stage 2 is going to have an aftermarket downpipe and catback installed. I was wondering if the Avo filter will fit on the Cobb system. A: This is only compatible with the Cobb filter and we are not able to confirm fitment with alternative manufactures. Does this work without a tune or access port? If not will u get most power out of it with no tune? A: This intake will not work without the proper tune or the use of an AccessPort with the Cobb specific map loaded onto your vehicles computer. A: We would recommend waiting until your first or second oil change. I have this setup on my 2011 STI and just bought a 2005 WRX wagon and wanted to ask if this will fit my 2005 WRX? A: This intake kit will not fit a 2005 WRX because Cobb designed it specifically for 2008+ models. A: Depends on brand of FMIC and the way the pipes are routed. The way the box is set up it blocks most of the left side inner fender to isolate the air filter from the engine bay. Is this carb legal for anything past 2009 models? Everywhere ive read it only goes up to 2009..
A: You are correct. CARB approval is pending for 2010+ models right now. I have a 2009 WRX Premium.. Curious if it will fit? A: Yes this would fit your vehicle. Sounds awesome, going to pick one up. My question is im running a stage 2 custom tune on my 2011 sti.. but i have the accessport also. Would i need a retune on my car with this installed?? Or can i just use my cobb to fix it while keeping the protune? A: If you have a custom tune, then you will need another custom tune after installing an intake. The AccessPort will not automatically alter your custom tune to support an intake.